Illegally parked RIOC vehicles, East Promenade. 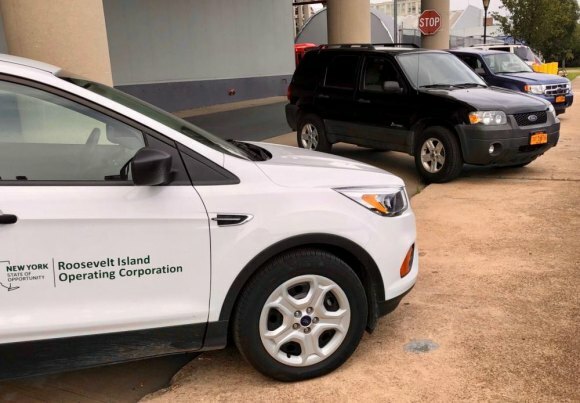 "I understand how a convenient parking spot is a limited commodity on the island, but these RIOC vehicles are obstructing the narrow promenade – used by pedestrians, bikers, joggers, scooters, strollers, etc.," Piro had written. "RIOC employees work for Island residents, and we do not deserve to have our infrastructurally-challenged promenade further obstructed by these vehicles. "I would appreciate you instructing the staff to park short of the promenade. I do not trust RIOC employees to self-regulate," he added. RIOC's huge fleet of vehicles has blocked this area of the Promenade since I ran the Island 15 years ago and daily navigated around them. Nothing new there, and problem that should never have existed solved, I tucked the story away in my news folder, just in case. Frank Farance summed it up: "Like the rest of us, who wouldn't love to just park in front of their building and walk 20 feet into their home/office? It's the suburban ideal. "Actually RIOC has a fenced parking lot another 20 feet away where the cars should be parked. Meanwhile, the rest of us have to walk up to 1/2 mile for our cars parked in Motorgate. "In summary, RIOC staff can't walk the extra 20 feet to properly park their cars. I guess when you're in charge of your own officers who do parking enforcement, you can park your car wherever you want." Lo and behold, problem not solved at all... Three days later, a dismayed Piro got his camera out again. "Three RIOC vehicles are already needlessly, selfishly obstructing half the width of the promenade in front of 680 Main Street. "Please explain this. Did RIOC’s executive team have their fingers crossed when they told you vehicles would no longer park here?" At Robertson's request, which Piro wishes to honor, we'll withhold RIOC's not as accommodating answer. But for the record, ten days after Piro originally contacted RIOC and three since correction was promised, cars parked by unconcerned RIOC employees who never seem to walk anywhere, not even from their enormous parking lot about 20 steps away, continued blocking the Promenade as they have for as long as I can remember.